Nottingham and Nottinghamshire Refugee Forum is set to host a free conference on the theme of the changing narratives around seeking asylum. Keynote speakers attending are Aidan White (Director of Ethical Journalism Network) and Dr. Helen O'Nions (Nottingham Law School, NTU). Further information on the event can be accessed on the Forum's website here. Tower Hamlets Local History Library & Archives will play host to an upcoming exhibition on News International and the Wapping Dispute. Please click on the flyer images below for a larger view. Spokesman Book's title Bad News: The Wapping Dispute, by John Lang and Graham Dodkins, is available from the Trade Union Classics section of our website. Another featured article from the latest issue of The Spokesman comes from the 2011 edition of J. A. Hobson's Imperialism. 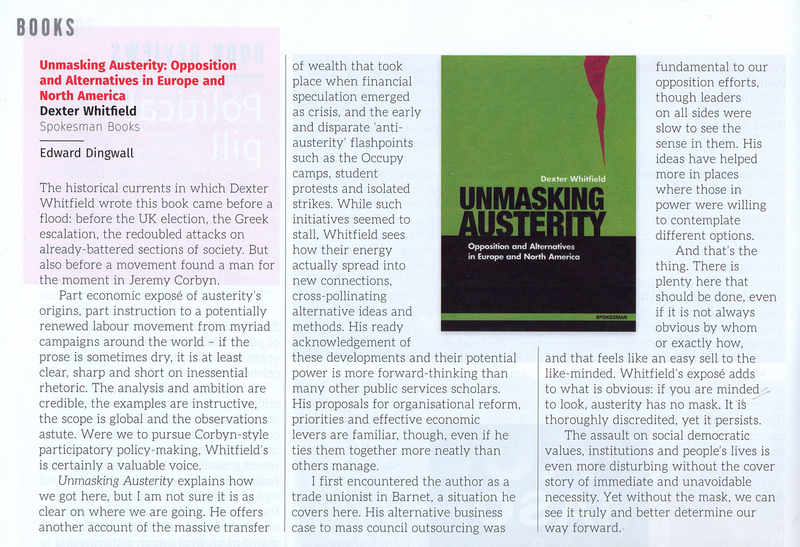 Jeremy Corbyn penned the book's foreword, which we reprint here under the title 'Internationalist at Work'. As a separate point of interest, we also include this comparative image of the logo of publication The Week, circa 1960s, and Corbyn's recent campaign logo. Cut from the same cloth? Issue 130 of The Spokesman, 'One Belt, One Road', is now available. Among the books reviewed in this issue are two titles on pacifism and conscientious objection: The World is My Country, by Emily Johns and Gabriel Carlyle, and Refusing to Kill, by Oliver Haslam and PPU Publications Group. Two peace-oriented publishers; two different approaches to presenting the lives of conscientious objectors and opponents of the First World War. The World is My Country calls itself a ‘celebration’, whereas Refusing to Kill is a more sombre appraisal, and pulls no punches. Read together, they prove there is room to remember both the anguish and the triumphs of this extremely diverse group. Visit Regent Street Cinema's page here, for more information on the event, and to book tickets. The next CSSGJ seminar will be held on Monday 26 October, 4-5.30pm in B7 The Hemsley, University Park. Dr Lucia Pradella from King’s College London will present on ‘Working into Poverty? The international political economy of the working poor in Europe’. The historical currents in which Dexter Whitfield wrote this book came before a flood: before the UK election, the Greek escalation, the redoibled attacks on the already-battered sections of society. But also before the movement found a man for the moment in Jeremy Corbyn. “I am incredibly proud to be here in Manchester today – the city where the trade union movement was born. Today tens of thousands of us –public servants, private sector workers, families, students –have come together to send a clear message to the government - no to austerity, yes to workers’ rights. Trade unions are facing one of the most challenging times in our history. The trade union bill is a fundamental attack on the right to strike. It is, in the words of Liberty and Amnesty International, a major assault on civil liberties in the UK. Strike action is always a last resort – nobody wants to lose a day’s pay. But let’s not forget that without it we wouldn’t have equal pay or an eight hour day. Ambassador Duarte kindly sent the Russell Foundation his thoughts on a notable date. Debate on nuclear disarmament is starting again at the United Nations in New York. A number of activities marked the International Day of Peace on 21 September, and more are scheduled for the forthcoming International Day for the Elimination of Nuclear Weapons, on Monday 26 September 2015. Bertrand Russell is hugely influential in China, and has been for almost a century. He is recommended reading for high school and university students. The General Manager of The Commercial Press, which has published Russell in translation in China since his nine-month visit in 1920-21, quotes him in speeches. Russell’s statement towards the end of his life, ‘What I have lived for', seems to have made a powerful and lasting impact. Russell's story in China is closely interwoven with that of The Commercial Press, which is itself an institution of some durability in the ups and downs of China’s recent history. The Commercial Press Head Office, built in the 1950s, is on Wangfujing Street in the centre of Beijing. Sergio Duarte held the post of United Nations High Representative for Disarmament Affairs from 2007-2012. He has shared with us his document Reflections on the Iran Agreement, which we blog here. Nottingham’s Albert Hall hosts the hotly-anticipated Rally for Corbyn on Thursday, 20th August at 7pm. Doors open 6pm. Alongside Jeremy Corbyn MP, speakers will be Richard Murphy, Manuel Cortes, Annmarie Kilcline, Tony Kearns, Nadia Whittome and Umaar Kazmi, with chair Cheryl Butler. Due to the high level of interest in this event, an early arrival is advised. Online event pages for the rally can be found on Corbyn’s campaign website (http://www.jeremyforlabour.com/rally_for_corbyn_nottingham) and on Facebook (https://www.facebook.com/events/1040901972596312/).